Listening Tests: Speaker Supports: Do They Make A Difference? Accessories are a source of amusement and anguish for audio enthusiasts. Like a good dressing they often seem to provide just enough pizzazz to turn an ordinary bowl of greens into something special. But there is of ten enough myth and hyperbole surrounding them to make your head spin. So it is with speaker stands. Almost anyone who has ever owned bookshelf speakers has considered buying stands for them. Speaker manufacturers, even those who make speakers designed to be placed against a wall, usually recommend that the tweeters be placed approximately at ear level or that the speakers be separated from side walls by some distance. Speaker placement has an important effect on sound reproduction, and often the easiest way to meet a manufacturer's recommendations is with stands. Like many other accessories, stands have built up a lore all their own. The conventional audiophile wisdom on speaker stands is now that, in addition to being the right height and size for your speakers. They must be (1) rigid, massive, and free of resonance, so that they do not impart their own sound: (2) stable, so that they don't topple over: and (3) firmly coupled to the room and the speaker itself, to avoid any relative motion that might blur and muddy the sound. On the other hand, occasionally you will hear it said that speakers work best when they are isolated from the room as much as possible. Go figure. Actually, each approach has some intellectual appeal. There are many speaker manufacturers who go to extremes to make rigid. inert cabinets for their products. so why would the rules for speaker stands deviate? And many professional recording studios go to great lengths to isolate control-room speakers to prevent them from retransmitting vibration and sound. Why not try that at home? In an effort to get the real skinny oil speaker stands in the living room, we conducted a series of blind listening tests to determine what stands contribute to the sound of a system. Do mass-loaded. super-rigid, spike-coupled stands make the sound better! What sonic role does isolation play besides keeping the teacups from rattling? In other words, what benefits do stands offer besides locating speakers properly and looking pretty? We conducted our experiments in three heats, using Snell K/II loudspeakers throughout. The K/II is a compact, high-performance two-way speaker system with an 8-inch acoustic-suspension woofer crossed over at 2.7 kHz to a 3 soft dome tweeter. For the first session, we mounted one pair of K/II's on Standesign DS-24 speaker stands. Regardless of whatever sonic attributes these stands might or might not have, they are definitely well built and attractively styled. The DS-24 is 24 inches tall (other heights are available) and constructed of solid, heavy 7 metal. Its 12 x 10-inch base can be fitted with four 1½-inch threaded metal spikes that will pierce even thick carpet and dig into the floor underneath. You can also attach four threaded spikes to its 6½ x 7½-inch speaker platform to dig into the underside of the speaker and complete the coupling. And, finally, you can make this already heavy and inert stand even heavier and more inert by pouring sand or lead shot (not included) into the top holes in the two long tubes that form the uprights. (We used shot.) We then mounted a second pair of Snell K/II's on relatively flimsy sup ports constructed of thin, "ringy," 18 inch-tall metal speaker stands taped on top of cardboard cartons used for shipping 12-inch car woofers. In this case we used a resilient, rather than rigid, coupling between the speaker and the top of the stand: four Audio Quest Big Feet isolators. The Big Feet are 2½ x 1-inch round pucks of Sorbothane, a rubbery absorbing material with the consistency of a tough marshmallow. They are quite easy to use because they are mildly sticky, so they stay put but don't leave anything behind when removed. The used speaker cartons were irregular with the result that on carpet the completed "stands" rocked considerably if antithesis of the rigid, tightly coupled spiked stands. Identical speakers were placed on pairs of adjacent rigid and non-rigid stands (the latter with energy-absorbing feet under the speakers). 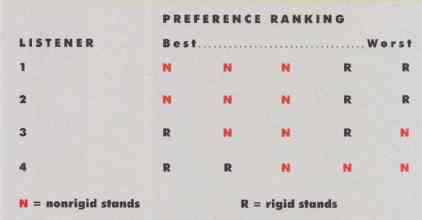 Each of five selector-switch positions was randomly assigned either to the rigid or non-rigid pair, resulting in two rigid assignments (R) and three non-rigid (N) assignments. For each switch position, listeners individually ranked the sound from "best" to "worst." From the results tabulated above, it looks like the non-rigid stands were the clear winner. 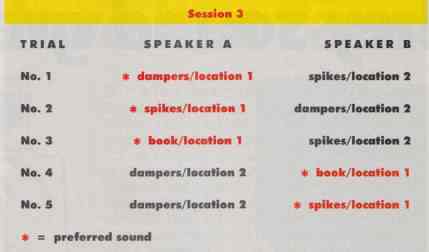 For this session, the locations of the speakers and their associated stands were reversed. The preferences of Listeners 1 and 2 still seemed to follow the non-rigid mounting, while Listener 3 stuck, though more weakly, with the location of the speakers. A fourth listener added for this session preferred the rigid stands in the positions occupied by the non-rigid stands in the earlier session. Overall a split decision. Our next step was to use the Snell Acoustics Room Analysis and Listening Environment Optimizer to determine the best left and right speaker positions in my 12 x 22¼ x 8-foot listening room. We put one of the rigid stands at the right optimal speaker position and one of the floppy stands at the left optimal speaker position. Then we positioned the other stand of each pair just to the outside of each optimal location and slightly forward, so that all the speakers were the same distance from the main listening position. The outside speakers were also angled slightly to make the angle of incidence for all the speakers identical at the listening position. We had previously measured the frequency responses of the four K/II speakers at 1 meter with an MLSSA Acoustic Analyzer to make sure they met Snell's ±0.5-dB specification for matching. We also used the analyzer to match the settings of the speakers' tweeter controls. Once the speakers were in place, we used the MLSSA analyzer and a Rane ME60 one-third octave equalizer to adjust the frequency responses of the speakers on the nonrigid stands to a tight match, as measured at the listening position, with the responses of the speakers on the rigid stands. We hoped by doing this to minimize incidental frequency response differences as a factor in the listening comparisons. Very little equalization was necessary-a maxi mum of 2 dB cut or boost, with no adjustments at all below 300 Hz or above 3kHz. The speaker pairs were driven by separate Stewart PA 100B amplifiers rated at 50 watts per channel. The source was a Denon DCD-1290 CD player routed through a five-position DB Systems switchbox. Switch-position assignments were determined by coin flips, which resulted in Positions 1, 3, and 4 playing the speakers on the nonrigid stands and Positions 2 and 5 playing those on the rigid stands. The speakers and stands were draped with acoustically transparent but visually opaque black cloth, while the amplifiers and equalizer were hidden with a cotton area rug. During the first listening session, three listeners were allowed to choose programs from a compilation CD with a wide selection of material and to switch freely among all five positions on the switchbox. They were permit ted to adjust the volume but seldom did. 1 asked them to evaluate the sound individually for each switch position on a numerical scale from 1 through 10 in four performance categories-spectral uniformity, spatial rendition, definition, and dynamics- and to rank the five switch positions in order of personal preference. The first session lasted 45 minutes. At the end, we asked the listeners to leave the room, and we reversed the positions of the rigid and nonrigid stands. The listeners from the first session then returned and, with a fourth listener added for this session, repeated the process, which again lasted about 45 minutes. The results showed that all three listeners preferred the nonrigid stands in the first session. So much for tight coupling, we thought. In the second session, two of the original three listeners again chose the nonrigid stands, while the third appeared to switch to a mild but ambiguous preference for the rigid stands (now located where the nonrigid stands had been in the first session). The added fourth listener seemed to show a clearer preference for the rigid stands in their new positions. It might be tempting to conclude from these first two sessions that non rigid mounting is preferable to tight coupling, at least to some degree. But I had found in initial dry runs that the sounds of even closely matched speakers tended to shift character as a function of room location, regardless of the type of speaker stand or mounting strategy used. We therefore put together a third session in which a single listener evaluated isolation techniques in a series of mono A/B comparisons with the two most closely matched speakers on the Standesign stands. The speakers were placed right next to each other near the middle of the room, and the listener was seated in their direct field. No equalization was used for this session. Each speaker was coupled to its stand by one of three means: spikes, the AudioQuest Sorbothane Big Feet dampers, and a large, heavy book (the AES Loud speaker Anthology). We changed the couplings between the speakers and the stands for each trial, and we also swapped the speakers back and forth between stands to make sure that any small differences between them did not become a factor. Result: In every case the listener's preference followed the speaker location, regardless of the mounting technique or which speaker was in that position at the time. So what does all this prove? Per haps nothing definitive, but the results of these listening tests do suggest some conclusions. In particular, there seemed to be no benefit to ultra-rigid loudspeaker mounting. If anything, our results tended in the other direction. Overall, however, the most consistent indicator appeared to be location. My bottom-line recommendation: Choose a speaker stand that looks good and gives you maximum flexibility in finding that right spot. In this test a single listener compared lust two identical, unequalized speakers, each operating monophonically. The speakers were placed on identical side-by-side rigid (Standesign) stands, the only differences being location and the coupling between the bottoms of the speakers and the tops of the stands: spikes, Audioquest Sorbothane Big Feet vibration dampers, or a book. The speakers and couplers were shuffled around between trials, but the listener's preference stayed resolutely with the location. What features are useful in a stand? Adjustable height? You bet, but hard to find. Spikes? They do help insure stability on thick carpeting, but we found no evidence that they improve the sound in any way, and they may damage hardwood floors and the bottoms of speaker cabinets. Extra mass? The small exposure to lead from handling 50 pounds of shot is not dangerous, but it seems like a waste of time. Vibration-damping isolators? Our test results are somewhat equivocal about these, and more investigation may be in order, but from what we know now I think their main value is to help keep other items on the same shelf as a speaker from rattling. Again, they are easy to install and will protect the speaker and the shelf when used as spacers, but unless anything is actually rattling, I don't think they affect the sound. Cheap stands? If they look good and are sturdy and stable enough to hold the speakers where you want them, they're probably just fine.